For decades I took the advice of sleep professionals and practiced good sleep hygiene. I kept my bedroom as dark as possible. I covered clocks with illuminated dials so I couldn’t check on the time during the night. I entered therapy, not just to solve my insomnia problem but it was one of my issues. I made a concerted effort to not emotionally provoke myself before bed. I thought only pleasant thoughts after closing my eyes. I went to bed at the same time every night, and I got up at the same time every morning. I didn’t take naps in the afternoon. But whatever new technique I adopted, it never had a measurable impact on my insomnia. My insomnia defeated all my best efforts. My problem was mostly what experts call “sleep maintenance” insomnia. I got to sleep the first time easily enough usually but woke during the night and couldn’t get back to sleep. During the day, particularly in the early to mid afternoon, I had a lot of difficulty staying awake at work. My desk seemed like a better place to sleep than my bed at home. I had trouble staying awake in meetings. It wasn’t because my work wasn’t interesting. I was working on NASA missions to the outer planets and US Air Force Star Wars projects. And it wasn’t just once in a while. It was practically every day. And it wasn’t as if I just felt drowsy. I was painfully sleepy. I would have to get up from my desk, go outside and walk around the block to keep myself awake. And even while walking in the bright Colorado sunlight, I was in a daze. I felt as if I were sleepwalking. My big beef with my rented apartment at the time was that it had thin drapes in my bedroom. The streetlight outside showed through my bedroom sliding glass door and made my bedroom unacceptably light. I was sure it contributed to my insomnia. Then I had an eyeopening experience. Following a business trip to Europe, I took a week of vacation to hike the Austrian/Swiss Alps. We stayed in what are called Huettes (huts) that provided meals and small foam mattresses in a communal sleeping loft. One of these huts had a loft that was so well built that it let no light whatsoever into our sleep area. I woke during the night, and had a bad reaction to this no-light situation. I couldn’t get back to sleep at all. I had panic attacks. My extraordinary emotional situation continued for a full six hours, until the sun started coming up and light did filter into the room. I then got a couple hours sleep before I had to get up for breakfast. When I got back home, I had a new attitude about the light filtering through the drapes in my bedroom when I was trying to sleep. It was comforting. I welcomed it. I slept better knowing I had a little light. This experience started me questioning the science behind sleep hygiene. I uncovered my clocks. I also started looking deeper into what was going on inside my own mind while I was trying to go to sleep that might prevent me from doing so. Twenty-five years of research led me to hypnagogia (sleep onset). The results of scientific research of this period of time, between when we close our eyes and when we are actually asleep, is what I present in In Pursuit of Sleep. The problem with sleep onset is that it has a multitude of distracting influences that keep you from going to sleep. 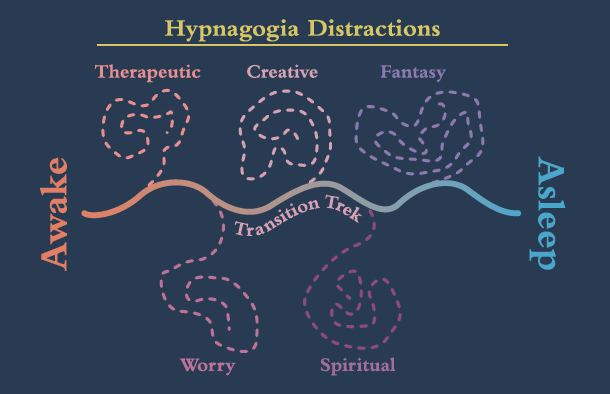 Not only that, during the later stages of sleep onset (what we also call hypnagogia) we lose much of our ability to control what is going on inside our mind, and our thoughts can rage our of control. This is the open door through which insomnia walks. In Pursuit of Sleep provides a safe way through this hypnagogic maze. It is called the Transition Trek. I leave you with a graphic that illustrates the problem and its solution.